The United States is producing more research scientists than academia alone can handle. The growth rate of tenure-track academic jobs is shrinking and research dollars in many fields are being cut. Many new STEM PhDs are anxious to move into industry but their training may not be a good fit or they may find that they are overqualified. 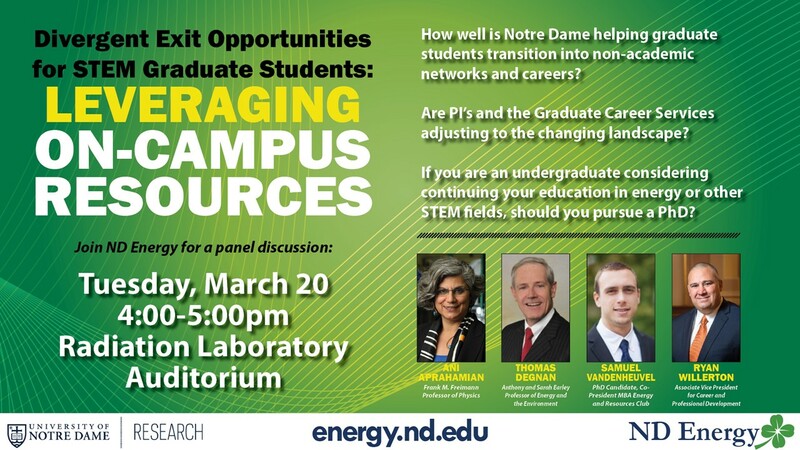 How well is Notre Dame helping graduate students transition into non-academic networks and careers? Are PI’s and the Graduate Career Services adjusting to the changing landscape? If you are an undergraduate considering continuing your education in energy or other STEM fields, should you pursue a PhD? ND Energy is bringing together a team of experts to help answer these questions and lead a discussion on this topic. They include a life-long research scientist, a professor with a business background, a representative from the graduate career services team, and a PhD candidate in chemistry. Prof. Ani Aprahamian is Frank M. Freimann Professor of Physics. In her time at Notre Dame, Dr. Aprahamian has served as Physics Department chair, director of the Nuclear Science Laboratory at Notre Dame, and was instrumental in obtaining a $10 million grant from the National Science Foundation to establish The Joint Institute for Nuclear Astrophysics (JINA). Her research has focused on gaining an understanding of the elements of the universe. She is a strong believer in directing graduate researchers into non-academic positions as well as an advocate of women in science. Prof. Thomas Degnan is the Anthony and Sarah Earley Professor of Energy and the Environment, Department of Chemical and Biomolecular Engineering. An alumnus of Notre Dame, Dr. Degnan worked for 3M and ExxonMobil before returning to campus in 2015. In 2012 he participated on a National Academies Panel on Challenges in Chemistry Graduate Education. His specific topic of discussion was “What are the skills industry managers need in PhD chemists, and how is employment of chemists and the skills they need evolving?” He has a wealth of knowledge on the topic and eager to join in the conversation with current graduate researchers. Samuel VandenHeuvel is a Notre Dame PhD candidate with the Sevov Group in the Department of Chemistry and Biochemistry. Currently, Sam is preparing to defend his dissertation and enter the working world. He has focused on materials and inorganic chemistry. His role as co-president of the Notre Dame MBA Energy and Resources Club and interactions with ND Energy were the inspiration for this panel. Ryan Willerton is the Associate Vice President for Career and Professional Development, Division of Student Affairs. Mr. Willerton oversees the new Center for Career Development on the fifth floor of Duncan Student Center. His portfolio includes supervision of the Career Development’s four functions: Graduate Career Services (serving master’s and Ph.D. students), Undergraduate Career Services, Employer Engagement, and Operations and Event Services. Mr. Willerton has served Notre Dame in various student life-focused leadership capacities over the last 19 years, and he looks forward to collaborating with students, faculty, and alumni to create tailored strategies and effective career services for all Notre Dame graduate students.